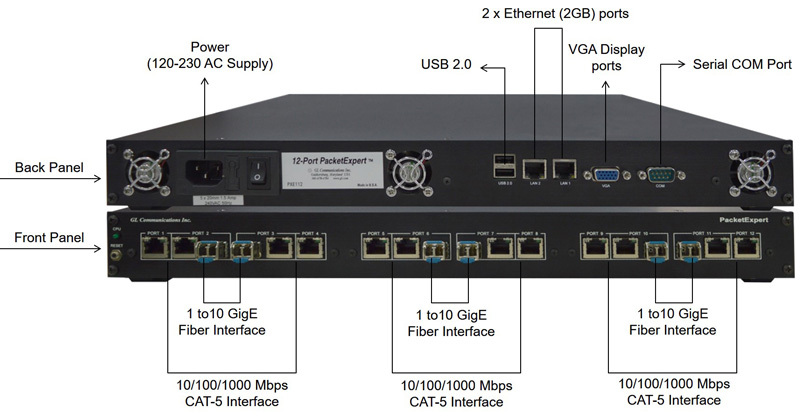 GL’s High Density GigE and 10 GigE Ethernet Test Unit - HD-PacketExpert™ offers high densities of 12 or 24 GigE or 10 GigE Ports for testing GigE and 10 GigE switches, routers and networks. This multi-device hardware unit incorporates all the features of a Single Wirespeed Quad Port 1 and 10 GigE PacketExpert™ units. It combines a Single Board Computer (SBC) with Windows® OS, remote accessibility via Ethernet Remote Desktop, and user-friendly GUI or CLI for test automation. Each of the 12 or 24 GigE or 10 GigE Ports of the device supports auto‐negotiation and flow control. The chassis of the unit comprises of both electrical and optical (fiber) interfaces. The Electrical Ports can operate up to 10/100/1000 Mbps line rates in Full Duplex mode, while Optical Ports can operate up to 1 GigE or 10 GigE line rate in Full Duplex mode. User defined Packet Size, Packet Rate, QoS for MAC, VLAN, IP, MPLS makes it a versatile tool to test any Ethernet based networking equipment or end to end Networks. The HD-PacketExpert™ can be easily deployed and securely fixed to an equipment rack, and provides extraordinary scalability to test Switches, Routers and Networks end-to-end. Wirespeed BERT measures Bit Error Rate on Layer1, Framed Ethernet (Layer2), MPLS (Layer2.5), IP and UDP layers. Supports generating various PRBS patterns such as 29-1, 211-1, 215-1, 220-1, 223-1, 229-1, and 231-1 including constant patterns such as All Ones, All Zeroes, Alternate Ones-Zeroes and user-defined test patterns ranging from 1 bit to 32 bits. Selection of optional sequence number insertion allows detecting out-of-sequence packets and packet loss. PacketExpert™ supports Throughput, Latency, Frame Loss and Back to Back tests as specified in RFC 2544. Similar to BERT, RFC 2544 can be performed over Framed Ethernet (Layer2), Stacked VLAN (Q-in-Q), Stacked MPLS, IP or UDP. RFC 2544 allows the test frame to be configured with Stacked VLAN and Stacked MPLS. This way, end to end RFC 2544 test can be conducted across a Carrier Ethernet/MPLS network. Multi Stream UDP/TCP Traffic Generator and Analyser is a hardware based Ethernet tester capable of generating multi-stream Ethernet traffic of varying packet length and also analyze the looped back traffic. The test results include Throughput, Frame Loss (Packet Loss), Frame Delay (Latency) and Frame Delay Variation (Jitter) metrics for each stream. Easily monitor the bandwidth performance using live throughput consolidated graphical view for all the streams (up to 16 streams per Port).